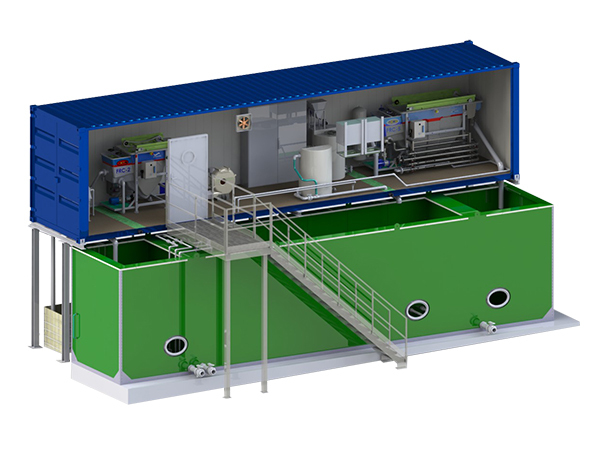 Container sewage pre-treatment plant - Ecokube sp. z o.o. Taking under consideration the fact that industrial sewage puts high demands on the systems that are responsible for its treatment, we offer mechanically-chemical system of wastewater treatment that includes parameters of raw wastewater from the industry. Excluding the averaging tank, all the main devices are put in containers. 3. Gravitationally, sewage flows to the averaging tank where it is mixed and aerated. 4. Aerated and mixed sewage undergoes coagulation and flocculation in a pipe reactor into which chemicals are dosed. 5. Sludge is transported into the flotator in which pollutions are separated and pre-treated sewage goes back to the sewer system. 6. Sludge from the flotator is hygienised and dehydrated on the filter press. If the client is interested in disposing sewage directly to the environment (in accordance with the law), biological degree is also included in the project. While proposing concrete solutions we always base on laboratory tested raw sewage parameters and the demands of local authorities. Machines and devices are adapted to individual clients’ needs and situation in the industry.